9:46 a.m., May 19, 2004--Senior quarterback Andy Hall, who led the University of Delaware football team to the 2003 NCAA Division I-AA championship, was named the Outstanding Senior Male Athlete of the Year during the men's intercollegiate athletics awards luncheon held Tuesday at the Bob Carpenter Sports/Convocation Center. Hall, who was selected by a vote of the head coaches of the 11 mens varsity sports programs, becomes the third straight UD football player to win the award. 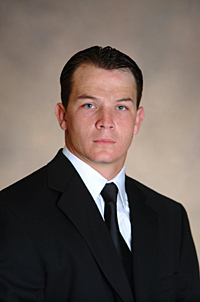 Linebacker Dan Mulhern was honored in 2003 and wide receiver Jamin Elliott was selected in 2002. Hall was a two-year starter for the Fightin Blue Hens after transferring from Georgia Tech. As a senior, he led UD to a 15-1 record and a national championship, completing 234 of 378 passes for 2,764 yards and 25 touchdowns and also rushing for 710 yards and eight touchdowns. He set school records for completions in a game (28 against Massachusetts) and season (234), passing percentage in a career (.574), and total offense in a season (3,474). Hall was a consensus All-American, earning first team Associated Press and College Sports Television honors. He was the Atlantic 10 Football Conference Offensive Player of the Year and the Maxwell Football Club Tri-State Player of the Year, and finished third in the voting for the Walter Payton Award, which is presented to the top offensive player in NCAA Division I-AA. The Philadelphia Eagles selected Hall in the sixth round of the NFL draft. Baseball: Senior first baseman Steve Van Note was the winner of the Papp Lukk Award as the UD Alumni Association most valuable player. A three-year standout after transferring from the University of Georgia, Van Note is batting .338 with 11 home runs, 49 runs batted in and a team-high 16 stolen bases. Also, senior pitcher Mike Mihalik earned the Student Services for Athletes Outstanding Contributor Award, the Perry Burkett Triple Play Award for leadership and special contributions to the team and the ECAC Medal of Merit Award presented to the letter winner with the highest grade point average. Mihalik has a 3.58 grade point average as a geology and geography major and was active as a HENS (Helping Each Newcomer Succeed) peer mentor and as a member of the Student Athlete Advisory Council. Basketball: Junior point guard Mike Slattery was the winner of the Col. C.B. Shaffer Award as the most valuable player. A three-year starter and team co-captain, Slattery earned third team All-Colonial Athletic Association honors in 2003-04, when he averaged 11.0 points per game and led the conference with 5.93 assists per game, which ranked 21st in NCAA Division I. An honor student as a sport management major, Slattery earned College Sports Information Directors of America (CoSIDA) District 2 All-Academic recognition. Cross country and outdoor track and field: Senior Patrick Riley was a double winner, earning the Alumni Association Award in cross country for the third straight year and also the Fred J. Harmer Alumni Association Award for outdoor track. One of the top distance runners in UD history, Riley won four races and was the top Blue Hen finisher in all eight cross country meets in 2003. He finished second at the Colonial Athletic Association and IC4A championships, and 18th at the NCAA District 2 regional meet. During the outdoor track and field season, Riley won the 5,000-meter events at the Monmouth and Maryland invitational meets and finished fourth in the 5,000 and 10,000 at the CAA championship meet. He finished 16th in the 10,000 at the Penn Relays and 19th at the IC4A championships. Football: Senior safety Mike Adams, a co-captain and the heart and soul of the national championship team, earned the Baker-Taylor Award as the most valuable player. Adams, who earned second team All-Atlantic 10 honors, led the team with four interceptions and was seventh with 70 tackles. He has signed a free agent contract with the San Francisco 49ers. Also, Adams earned the Dr. Janice Jordan Award, which is presented by UD Student Services for Athletes to a scholar-athlete who has made outstanding progress academically while at UD. Golf: Freshman Joe McLister was the winner of the John J. DeLuca and Scotty Duncan Alumni Association Award. In just his first varsity season, McLister enjoyed outstanding success, leading the Hens with a stroke average of 75.80, the fourth best single season mark in school history, and shooting better than 80 in all but one of his 25 rounds. He finished second at the Temple Classic and fourth at the Don Mershon and the Scotty Duncan Memorial tournaments. Indoor track and field: Senior Jerome Holder, a four-year letter winner in hurdles and sprints, earned the Alumni Association Award. During his senior season, Holder set a school record in the 60-meter hurdles with a time of 8.20, had three top four finishes in the event and qualified for the IC4A regional meet, where he placed 23rd in the 60-meter hurdles and 22nd as a member of the 4 x 400 meter relay team. Lacrosse: Senior attack Matt Alrich, UDs leading scorer the last two seasons, earned the Alumni Association Award after leading the 2004 Hens to a record of 10-6 and a berth in the CAA semifinals. Alrich was named first team All-CAA and led all players in the conference with 46 points on 34 goals and 12 assists. Alrich is just the 27th player in UD history to reach 100 career points for a career, with a total of 83 goals and 20 assists. Soccer: Freshman defender Matt Haney received the Alumni Association Award, starting 19 of 20 games and leading a unit that helped post five shutouts. He was the team's second leading scorer with three goals and one assist. An outstanding student, he earned a spot on the 2003 CAA Academic Honor Roll. Swimming and diving: Freshman Brendan Spencer earned the Jack and Hugh Dougherty Alumni Association Award as one of the team's most versatile performers. He posted the team's best time in the 200 butterfly (2:00.99) and second best times in the 100 freestyle (49.18), 400 individual medley (4:21.99), 100 backstroke (55.51) and 200 backstroke (1:57.96). At the CAA championship meet, Spencer finished eighth in the 200 freestyle relay, ninth in the 800 freestyle relay, ninth in the 400 medley relay, 10th in the 200 medley relay, 20th in the 200 backstroke and 26th in the 200 butterfly. Freshman Rob Panas earned the swimming team's Thomas Baranello Award as the most improved athlete. Tennis: Sophomore Adam Liebman won the Alexander J. Taylor Alumni Association Award after posting a mark of 14-11 in singles during the 2003-04 season, where he played mostly at the No. 3 spot. In doubles, he was 3-3. Liebman helped UD advance to the CAA tournament quarterfinals. Also, John Tully earned the Lee J. Hyncik Memorial Award as the junior member of the team with the highest grade point average and the Miles Powell Jr. Scholarship, which is presented to standout scholar-athletes who are also engineering majors at UD. A three-year standout for the Hens, Tully posted the team's best singles record this past season with a mark of 18-8 at the No. 1 and No. 2 spots and also recorded a mark of 11-9 in doubles play. He carries a 3.362 grade point average as an electrical and computer engineering major.